Nelson Mandela Foundation Chief Executive Achmat Dangor outlined the Foundation’s plans to celebrate Nelson Mandela’s 90th birthday. 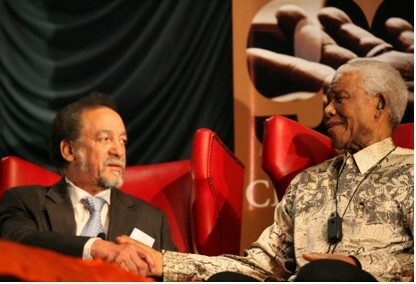 March 5 2008 – Nelson Mandela’s charity organisations announced their plans in Johannesburg to celebrate the former South African president’s 90th birthday, which is on July 18 this year. The launch of the Mandela School Community Network by the Nelson Mandela Institute for Educational and Rural Development and the Department of Education, later this year. Nelson Mandela Foundation (NMF) chairperson Prof Jakes Gerwel gave tribute to Mr Mandela’s legacy at the event, which was attended by Madiba himself, his wife, Graça Machel, his daughters Zindzi and Zenani and other family members, as well as other invited dignitaries and the media. Prof Gerwel said the birthday events programme, entitled “A Celebration of Ideas”, demonstrated Mr Mandela’s and the organisations’ “commitment to work for the upliftment of our country over at least the next 90 years”. “Madiba has decided to join us here today not only to see all of you and to thank you for your support in making freedom a reality, but also to witness as we again make our pledge to him and to you, that we will continue his work on the long road ahead. We know that this road is a long one but we promise Madiba that we have the stamina and determination to travel it,” said Prof Gerwel. 46664 Communication and Public Relations Manager Chantal Cuddumbey said support for the Hyde Park concert “has been amazing”. “It is indeed fitting that 20 years after the “Free Mandela” concert which was held at Wembley Stadium, London will be the city hosting an event to celebrate Nelson Mandela’s life and legacy,” said Cuddumbey. She outlined the launch of the Mandela School Community Network in May “as an engine for wider school change”. Porteus said the institute would choose schools in rural areas that demonstrate excellence and serve impoverished children. Porteus said she committed the organisation to “re-imagine, replan and recommit to the realisation of justice in education in our lifetime”. SA Liberian Ambassador Lois Brutus said it was an honour for President Ellen Johnson-Sirleaf to be the guest speaker for the sixth Nelson Mandela Annual Lecture. “It is a pleasure for the first elected female African president to be guest speaker on such an occasion, and for me, the Kliptown venue is so moving. Previous speakers at the annual lecture were former United States President Bill Clinton, Archbishop Desmond Tutu, Kenyan Nobel Laureate Wangari Mathai, President Thabo Mbeki and former UN Secretary General Kofi Annan. 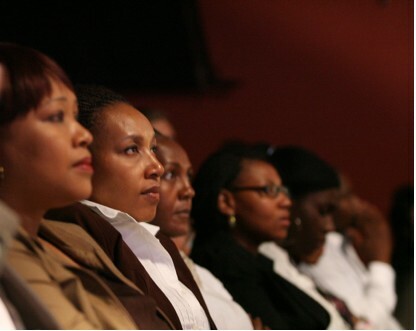 One of Mr Mandela’s daughters, Zindzi Mandela, said: “We are obviously immensely proud. It’s great to see his legacy being documented now that he is in his sunset years. Thank you, South Africa.” She also urged the nation to remember the example her father has set the country during currently difficult political times. 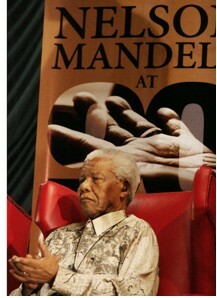 Dangor said the programme of events had been developed with Mr Mandela’s philosophy in mind. “These events have to be inclusive, they musn’t be elite and they must focus on people who can most benefit from the activity, and that is why we’re focusing on the young people this year,” he said. “I think all he would want to see is that we do not exclude people, we do not undermine the fundamental ethos that he believes in, such as non-racialism and an ability to reach out to all people, especially ordinary people,” he added. Dangor said there would be no public events on Mr Mandela’s birthday on July 18, which he will spend with his family at his home in Qunu, Eastern Cape.